Data recently obtained by Bikers United under a Freedom of Information request to the Metropolitan Police shows a welcome decline in the number of motorcycles stolen in the London area. Further encouraging news highlighted by the figures shows an increase in the proportion of bikes recovered intact, though the overall recovery rate fell. The data provided by the Met was for the whole of 2017 and the 10 months to October 2018 (the latest period for which data is available). The data shows the number of thefts on a sharp upward trend in the early part of 2018, with the number of bikes stolen in January 2018 50% higher than in January 2017, and 13% higher in February 2018 vs February 2017. However from March 2018 onwards the number of thefts declined markedly in every one of the remaining months to October 2018. Sadly the rate of recovery of stolen motorcycles is in decline. In the period to October 2018, 61.6% of stolen bikes were recovered, down from 62.9% in the corresponding period of 2017. However, the good news is that the proportion of bikes recovered intact is increasing, with 24.1% of bikes stolen in the 10 months to October 2018 recovered intact, compared with 20.9% in 2017. These statistics underline the ever present need for vigilance and to avoid the “it won’t happen to me” mentality. 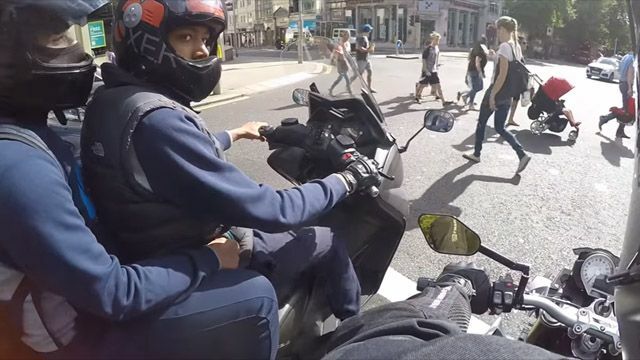 With over 14 motorcycles stolen every day from the streets of London, unswerving precautions against theft and adequate securing of your bike whenever and wherever it is parked, has never been more important. Chain it – even a casual thief will be able to break through a poor quality chain in seconds, so make sure your chain is sturdy (generally the more expensive the better), and ideally Thatcham approved. No chain will stop the most determined of thieves, but you can at least slow them down and make it as difficult as possible, hopefully to the point where they give up. Wherever possible chain the bike to something immovable such as a fence, lamppost or ideally a ground anchor. Anchor it – a ground anchor is well worth investing in for your regular parking place. The minimal installation effort will pay dividends. Cover it – not only does a cover come with the obvious benefit of protecting your bike from the elements, it is also a useful way of making it less noticeable to thieves. Disc lock it – a useful extra solution and very easily portable – just don’t forget to remove it when you move off (a disc lock cable is a useful and inexpensive reminder). Alarm it – alarms on the bike itself or in the garage (ideally both) are well worth investing in. Alarmed padlocks offer a cost effective solution as well. Track it – Trackers can be expensive, but are invaluable in terms of recovering stolen bikes. Under some circumstances they can pay for themselves via cheaper insurance costs, or at least will often lower your premium. No security measures will ever make a bike immune from theft, but you can significantly reduce your chances of your pride and joy being stolen by taking the necessary precautions every time you park.